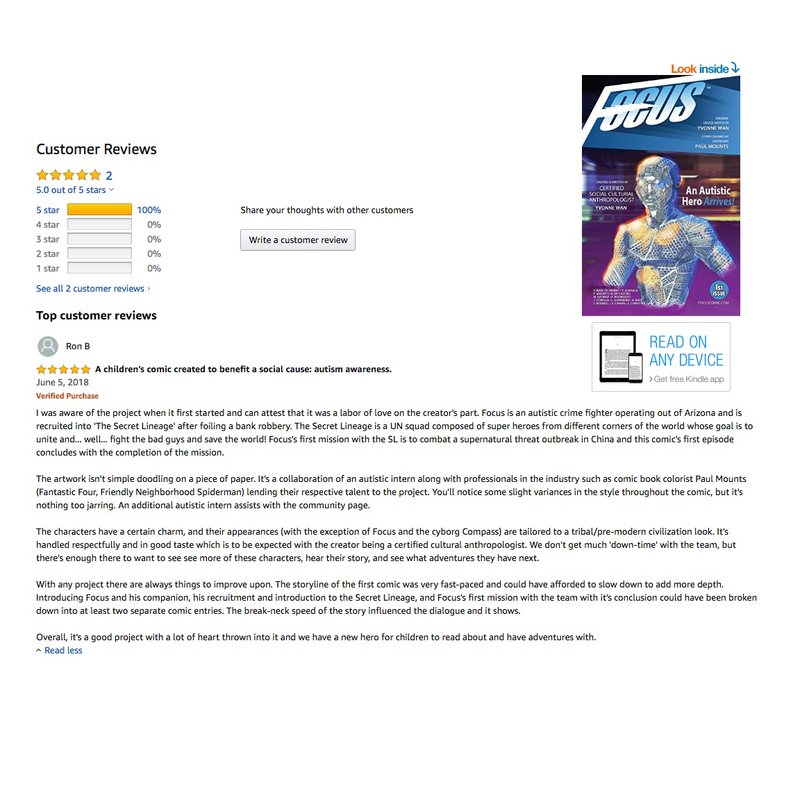 Thanks Ron Brown for writing a great review on Focus™ Comic which features an #autisticsuperhero. Buy now at www.focuscomic.com in print and digital format. Available on all mobile devices and computers for $4.99 globally! We will be at Greater Austin Comicon and Ace Comicon this month! Come and find us. Save on shipping and get our autographs also! 5.0 out of 5 stars A children’s comic created to benefit a social cause: autism awareness. I was aware of the project when it first started and can attest that it was a labor of love on the creator’s part. Focus is an autistic crime fighter operating out of Arizona and is recruited into ‘The Secret Lineage’ after foiling a bank robbery. The Secret Lineage is a UN squad composed of super heroes from different corners of the world whose goal is to unite and… well… fight the bad guys and save the world! Focus’s first mission with the SL is to combat a supernatural threat outbreak in China and this comic’s first episode concludes with the completion of the mission. The artwork isn’t simple doodling on a piece of paper. It’s a collaboration of an autistic intern along with professionals in the industry such as comic book colorist Paul Mounts (Fantastic Four, Friendly Neighborhood Spiderman) lending their respective talent to the project. You’ll notice some slight variances in the style throughout the comic, but it’s nothing too jarring. An additional autistic intern assists with the community page. The characters have a certain charm, and their appearances (with the exception of Focus and the cyborg Compass) are tailored to a tribal/pre-modern civilization look. It’s handled respectfully and in good taste which is to be expected with the creator being a certified cultural anthropologist. We don’t get much ‘down-time’ with the team, but there’s enough there to want to see see more of these characters, hear their story, and see what adventures they have next. With any project there are always things to improve upon. The storyline of the first comic was very fast-paced and could have afforded to slow down to add more depth. Introducing Focus and his companion, his recruitment and introduction to the Secret Lineage, and Focus’s first mission with the team with it’s conclusion could have been broken down into at least two separate comic entries. The break-neck speed of the story influenced the dialogue and it shows. Overall, it’s a good project with a lot of heart thrown into it and we have a new hero for children to read about and have adventures with. ← Our first reader review on Kindle!